The Approach of Russia’s Baltic Fleet – The Tsar’s Last Armada. During the Russo~Japanese War of 1904~05 the Russian Naval Fleet was at war with the Imperial Japanese Navy. 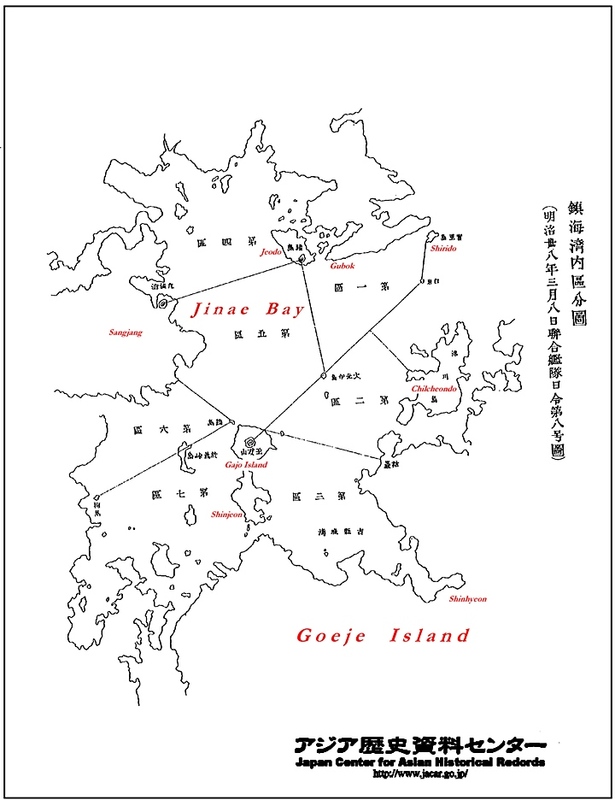 The Russians were anchored and fighting at Port Arthur (Lushun-Dalian) on the Liandong Peninsula. The ships of the early 19th Century were coal powered and poorly equipped for this gruelling journey. By the time the poorly trained/armed Russians reached the waters surrounding Korea the bottoms of their ships were so heavily fouled they could barely reach 8 knots. These factors would help seal of the fate of Russia’s doomed Baltic Fleet. Above are original Japanese Naval Maps of the Western hemisphere. The path of Russia’s Baltic Fleet has been highlighted in green. As mentioned, the two charts above are Japanese maps from the Russo-Japanese war of 1904~1905. If you look carefully at the maps you can see the date written around each position at any given time. As Russia’s Baltic Fleet sailed half-way around the world news spread of the impending battle to follow. 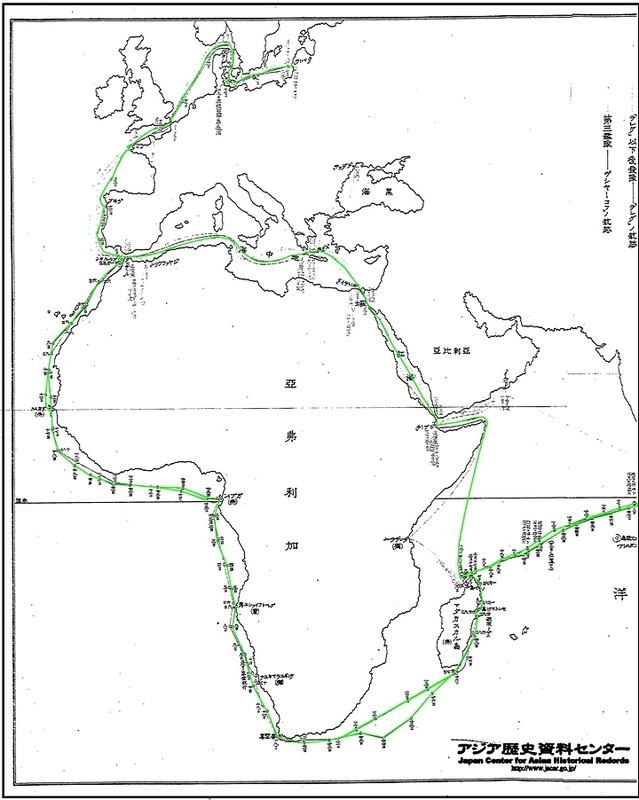 By January of 1905 the Russian Baltic Fleet rounded Madagascar. Russia’s Pacific First Fleet in Port Arthur (Dalian) was either sunk or captured and the Japanese Navy could now concentrate their efforts on defeating the Baltic Fleet. The early months of 1905 were the climax of the Russo-Japanese War both in terms of naval and ground warfare. 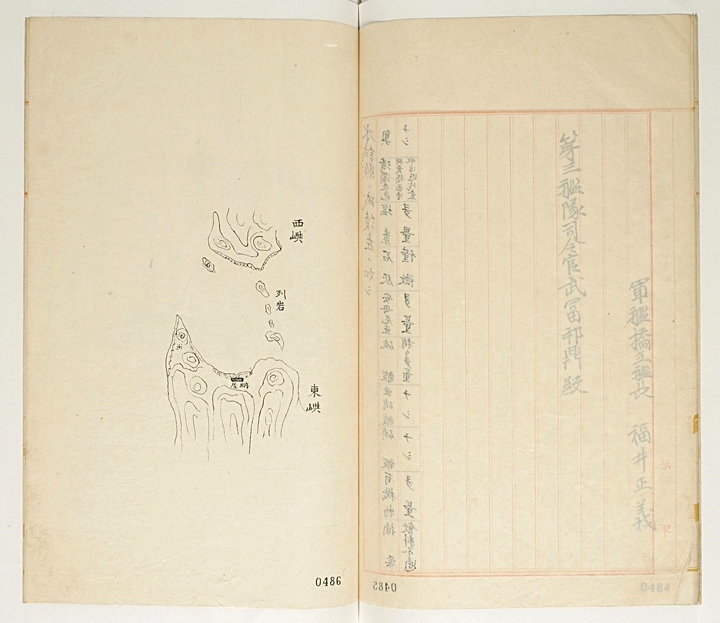 In Mukden (Shenyang), China half a million Russian and Japanese soldiers massed for battle, Port Arthur was surrounded, and the Baltic Fleet was fast approaching. This explains why Japan quickly annexed Dokdo without any foreign notification in February of 1905. When Port Arthur (Dalian) fell, the Japanese Navy realized the Baltic Fleet had only one option. The Russians could only find safety in Vladivostok Harbor North of Korea. 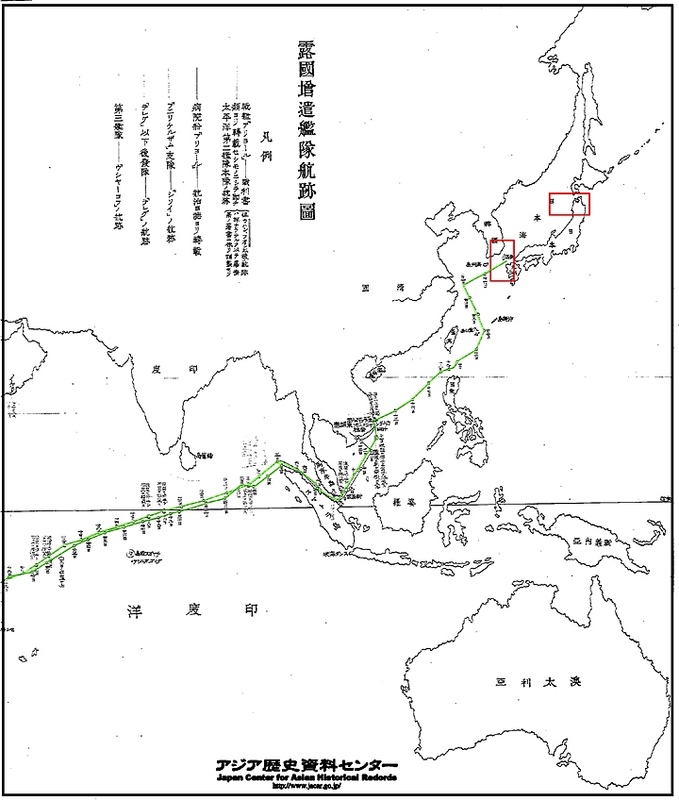 A plan had been drafted for the imminent naval confrontation the Japanese assumed would take place in one of three critical locations in the East Sea (Sea of Japan) These areas are boxed in red on the map above. The Japanese Imperial Navy began to appropriate and zone the waters surrounding Korea’s South and Easts coasts to prepare for each possible scenario. 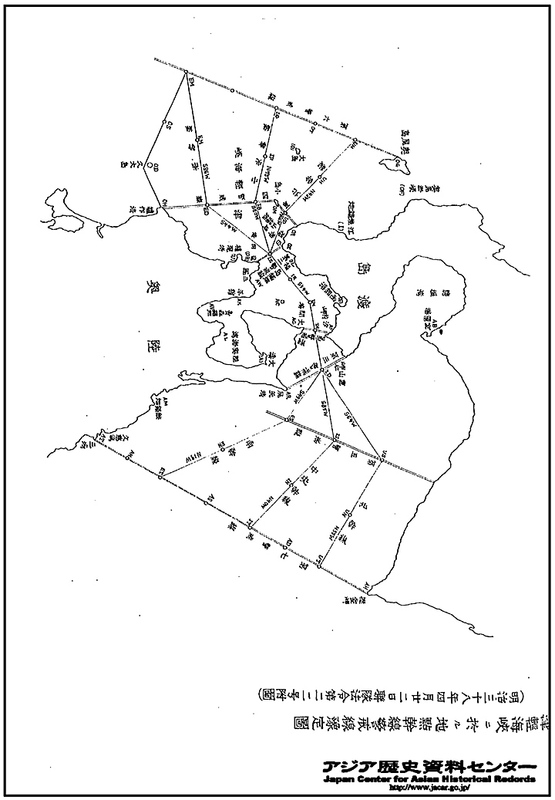 The maps below illustrate how the waters surrounding Korea first were zoned geographically. From there naval regiments were assigned to designated areas. Of course Dokdo, (Liancourt Rocks) was intergrated into this defence plan. There were three routes the Russian Baltic Fleet could take to reach Vladivostok. 1. They could steam through the Chosun Straits to the West of Tsushima Island. 2. They could sail through the Tsushima Straits to the East of Tsushima Island. 3. They could travel all of the way around Japan’s East Coast and then through the waters between Hokkaido and the Japanese main island of Honshu. This would require extra coaling at sea which was very dangerous. This route was highly unlikely. Nonetheless, as the maps below show, Japan devised a plan should this happen. 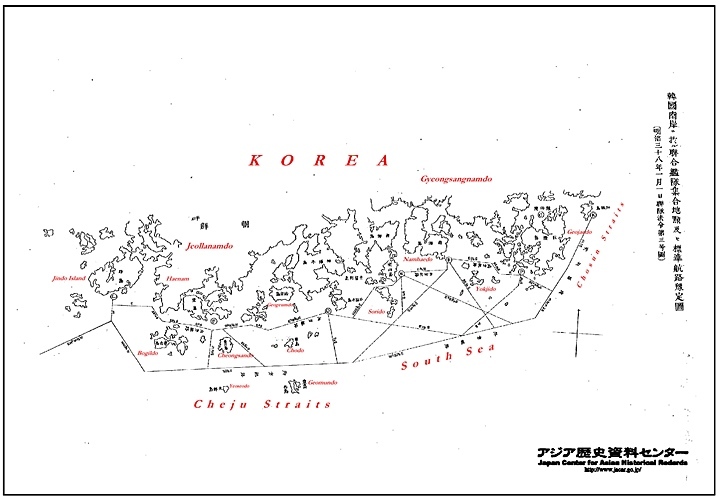 Japan’s Navy maps and zones Dokdo’s waters immediately before her annexation of the islets. The map above is an original Japanese Imperial Navy map showing how the Dokdo region was incorporated into Japan’s strategic attack plan in preparation for Russia’s Baltic Fleet’s arrival. It has been labeled in English (red and blue) for reference. The map above is an original Japanese Imperial Navy map of the East Sea (Sea of Japan) It is dated the 38th year of Meiji January 1st (1905) This chart predates Japan’s annexation of Dokdo by about a month. The map is tilted showing South~North as left~right respectively. The position of Cheju Island and the Southern coast of Korea has been distorted by the cartographer for the purpose of including all important regions on the map. As the Japanese prepared a war plan for the advance of the Russians, the map above shows how the Imperial Navy mapped, zoned and then asigned certain naval regiments to each area that lie en route to Vladivostok Harbor in Russia. It is not plausible such an complex war plan was drafted overnight. Thus, well before Shimane Prefecture Incorporated Liancourt Rocks, (Dokdo/Takeshima) was already intergrated into the Japanese Imperial Navy’s war strategy. Dokdo (marked in blue above) can be found within the boundaries of the region marked as the central regimental area. The most disturbing aspect of this map is that some of the areas zoned as under Japanese naval control were not part of Japanese territory. The maps below are again Japanese Naval maps from the Russo~Japanese War of 1904~1905. 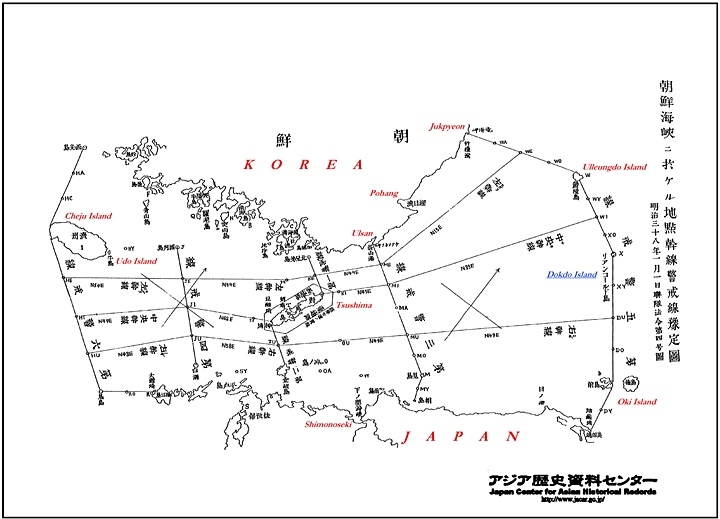 These charts show how Japan had mapped various regions of Korea and the Japanese coastline and assigned each zone to specific fleets of the Japanese Imperial Navy. The largest map directly below this text is the southern Korean port city of Chinhae where the Japanese had their navy stationed . In these waters near the southern coast of Korea, Admiral Togo waited to ambush as reports of the Russian Baltic Fleet’s position kept him informed. On May 27th, arguably the most important naval battle in history took place in the waters near Dokdo. In fact, the Russian Rear Admiral Nebogatov would issue the international code for surrender XGH, just South of Liancourt Rocks (Dokdo). Further West, Russia’s Captain Lebedev would scuttle the warship Dimitri Donskoi near Ulleungdo Island. 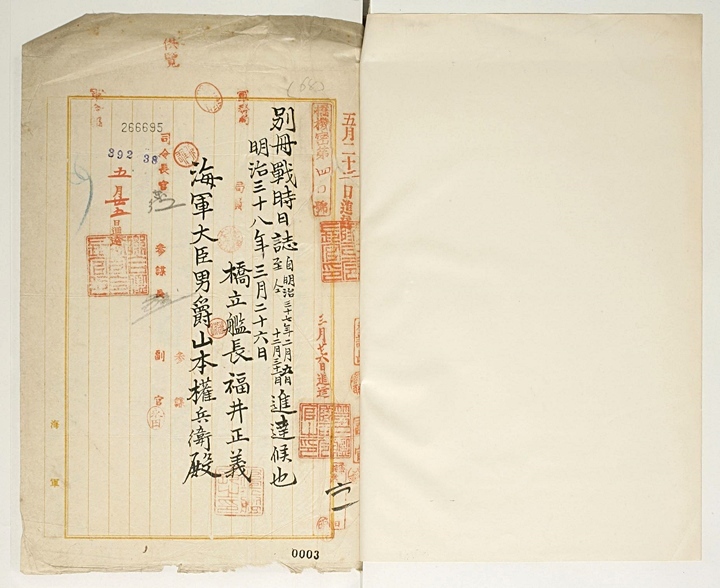 The defeat of the Russians around the waters of Ulleungdo Island and Dokdo first spurred a sense of urgency in the Japanese to step up military construction in the region. With the Russian Navy being less of a threat, the Japanese weren’t as concerned about being attacked while constructing watchtowers. 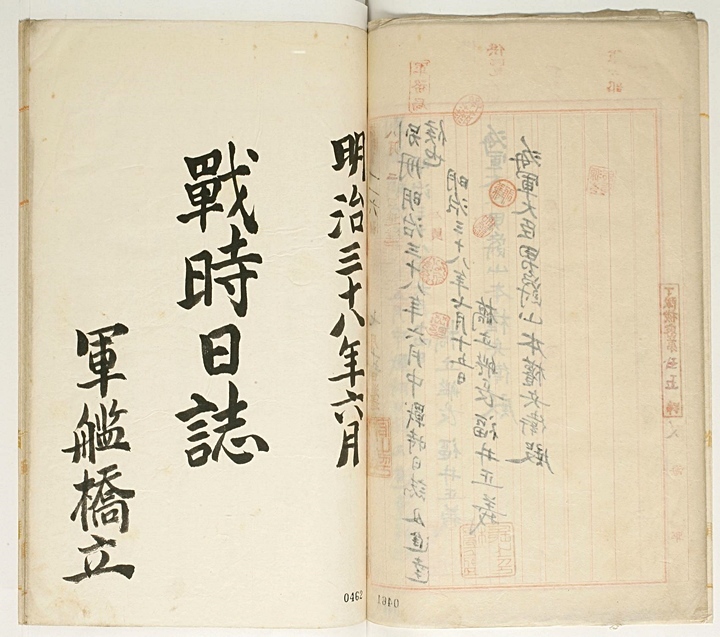 The Battle of Tsushima confirmed the strategic value of Ulleungdo and Dokdo and more detailed plans to build military facilities on Dokdo were drafted immediately following the Battle of Tsushima. The map above left is a Japanese regimental map of the southern coast of Korea. Here it can be observed the entire coast has been zoned and assigned to various regiments in preparation for the Russian Baltic Fleet. Above center is a maps of Korea’s Jinhae Harbour where the Japanese Naval Fleet was stationed. To the right above is a regimental zone map of the straights separating the Japanese main island (Honshu) and Hokkaido in case the Russian Fleet chose to avoid the Tsushima Straight and voyage around Japan’s Honshu. 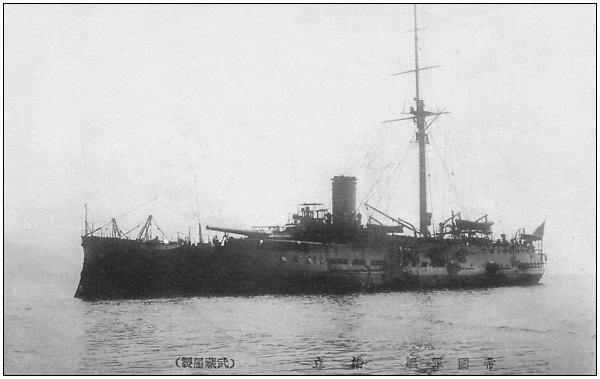 The IJN Hashidate (橋立) was a protected cruiser of the Imperial Japanese Navy, designed by Emile Bertin, and built by the Yokosuka naval shipyards in Japan. The Hashidate (right) was the 3rd and last ship in the Matsushima class, and was the only one constructed in Japan. During the Russo-Japanese War, the hopelessly obsolete Hashidate and her sister ships were assigned to the 5th squadron of the reserve 3rd Fleet. 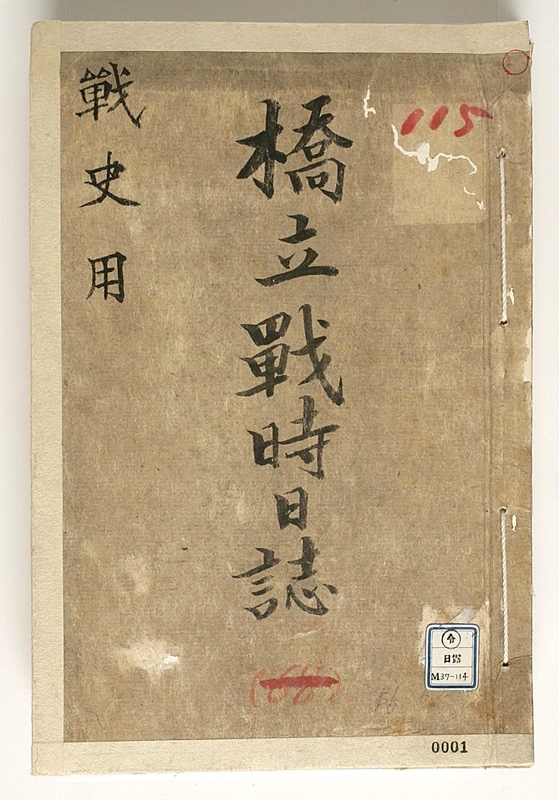 The Hashidate’s survey of Dokdo took place immediately after the Battle of Tsushima on May 28th 1905. As shown Japan had already noted the strategic importance of Dokdo almost a year before. As the seas around Ullungdo and Takeshima/Dokdo became the main sea battleground, the island’s military value came to be highly valued. 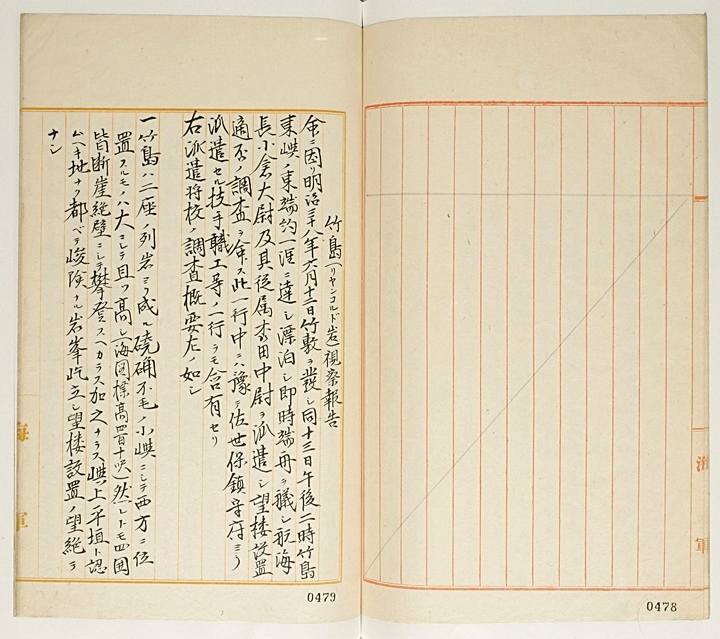 Above are images of the Japanese Warship’s Logbooks from June 1905 immediately after the Battle of Tsushim. It records the construction of military facilities on the islets. 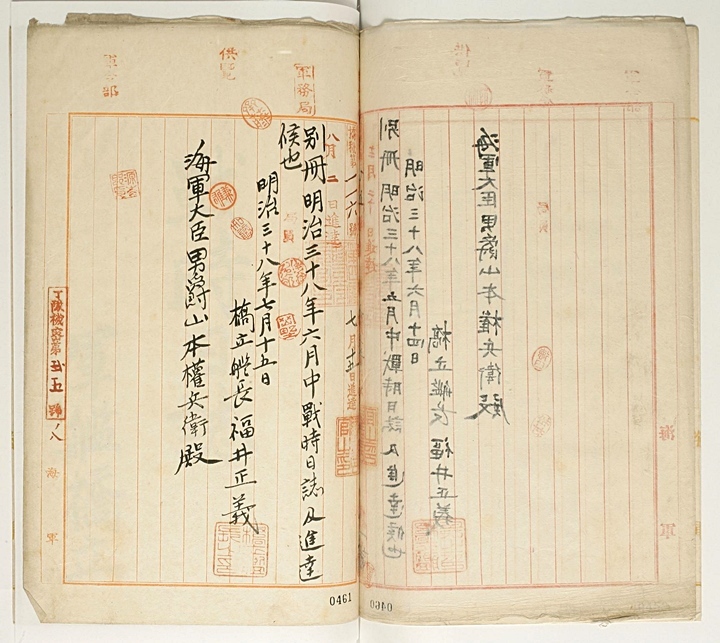 Japan’s plans for military structures on Dokdo began in the fall of 1904, during the Russo Japan War. Departed at 8:00 A.M. Watched for any signs of attack. We recieved notification #100. Orders #47 and #48. “..Headquarters in Sasaebo dispatched some personnel of the construction department, who are to be sent over to Takeshima (Dokdo) on the Hashidate. Instructions of the dispatch are to be delivered directly to the Hashidate via the Kenkai Maru (ship name) which departs from here tomorrow morning. One navy engineer and five other workers of the constuction personnel mentioned above are to arrive at Takeshiki this afternoon via the Haechiko Maru in Sasaebo (naval base, Nagasaki). At 7:35 P.M. we thus went to Takeshiki to load up with provisions. 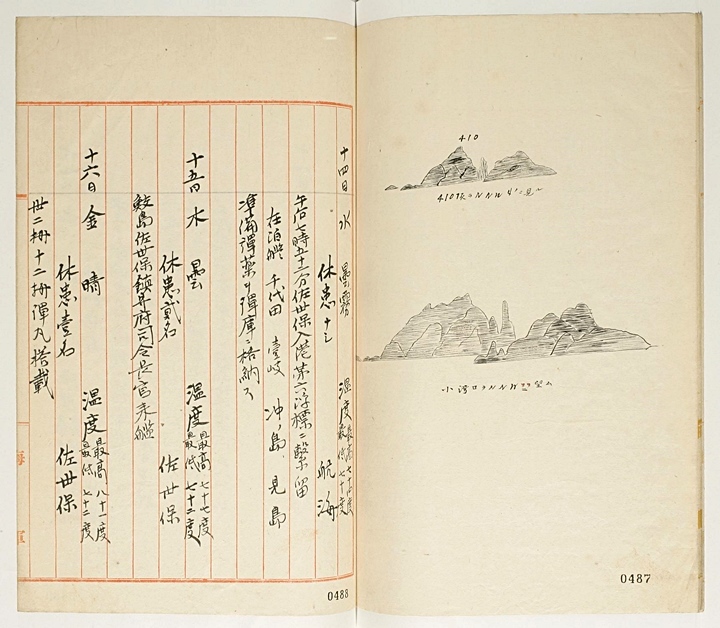 Ships at anchor, the Su-ah, the Matsushima, the Izuma and the Akijushima. At 3:40 P.M. they returned after finishing their invetigation. From then on, according to the 5 Jeoncha confidential information #47 set off toward Sasaebo. 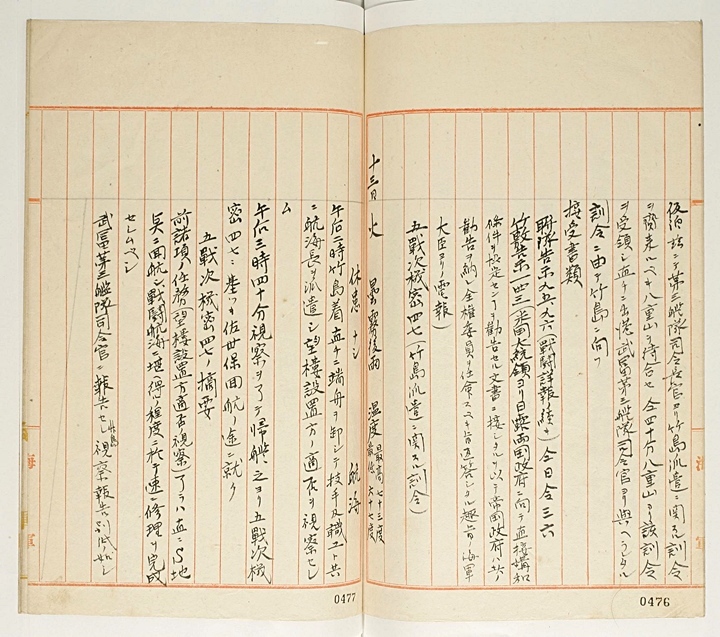 According to the order we departed from Takeshiki on June 12, 1905, arriving about 1 ri at the East side of the East Islet on Takeshima at 2:00 the next afternoon. While floating on location, we lowered a small landing craft to dispatch the investigating officer Lieutenant Okuura and Lieutenant Second-Class Okida as an assistant to investigate the suitability of watch tower installations. The engineer and other workers from the Sasaebo headquarters were included in the dispatched group. The Report of the Investigation by the officers above is as follows. “…The East Islet stands less high than the other one (estimated to be 325 feet in altitude) and not so steep as to make climbing possible even though it could be challenging. On the top of this islet is a relatively flat, dish shaped area, and it will be possible to erect structures by dumping landfill. “…are currently a few little huts built by fishermen, where about 30 people are temporarily staying. To transport materials to the top of the mountain, a machine like a derrick would be useful, and to climb up the steep cliffs another machine (bulldozer?) could be considered as an option. From the top of the West islet runs down a little stream but the water contains too much salt to drink. A test result shows the water is not suitable for drinking. 1. It is not possible to plant vegetables as well to provide watch tower personnel with food because the top of the island is too infertile to be called soil and there is not enough precipitation. “…To the northwest of the East Islet, however, lies a line of a reef, which is estimated to be two ryeon (1,200 feet) long. Now is the hunting season for seals on this island, and about 35~36 fishermen from Oki Island are catching a large number of seals with rifles and nets. What has been learnt through a talk with these fishermen during the survey was thought to be useful and therefore recorded below. “…he’s willing to spend his winter on the island. Other than sea lions, a small amount of abalone is also caught. In terms of weather, in the summer it gets very hot during the midday and quite cool in the morning and the evening. The worst hot spell comes in June by the lunar calendar. The island gets thick fog and a very small amount of rainfall compared to Japan. The nearby currents, like the ones in the northeast, are not slow, and the difference between high and low tides is about four feet. According to this report, it is believed to far exceed four feet , but this figure is considered doubtful according to local fishermen. Because there are no trees and water on the island, they go to Okino and come back once or twice a month to be provided with food, wood, and other things. Clarity and colour: Light brown, microscopic floating particles. Lactic Acid: Slightly large quantity. At 7:52 P.M. we arrived at Sasaebo. Moored to No.6 Bouy. Other anchored ships included the Chiyoda, the Iki, the Okinoshima, and the Mishima. We stored the prepared ammunition in the warehouse. Number of sick personnel: Two Sasaebo. Samaejima, Commander of Sasaebo Naval Base gave an inspection. Japan’s Military Annexation of Dokdo – Why does it matter? 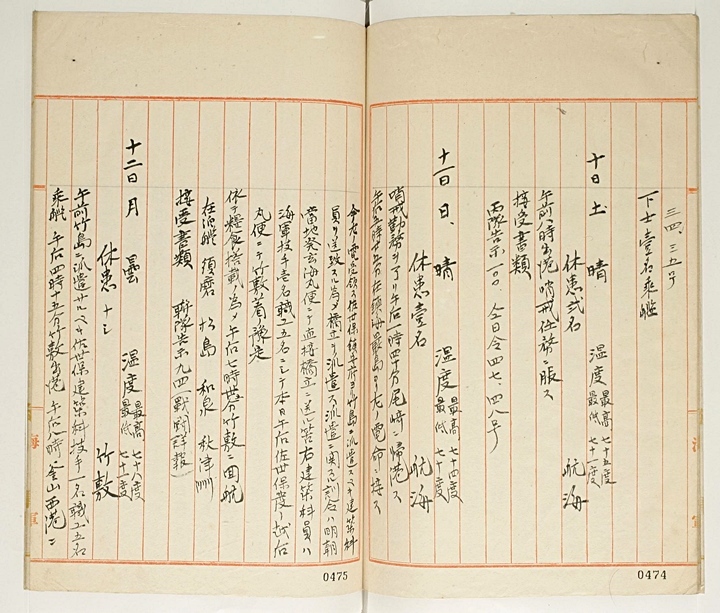 This website has dedicated a great deal of time and effort in documenting Japan’s military activities on Dokdo island, most notably in the time just prior to the annexation of the island. What difference does it make if Japan really did seize the island for control of the region? It seems those who lobby to have Takeshima returned to Japan are of two minds. Those whose opinions are extremely right wing and don’t care, or those who haven’t studied the historical facts of Japan’s only documented claim to Takeshima in 1905. The purpose of pointing out Japan’s military activites of the past isn’t to vilify the Japanese but rather to give historical context to the Shimane Prefecture Inclusion. 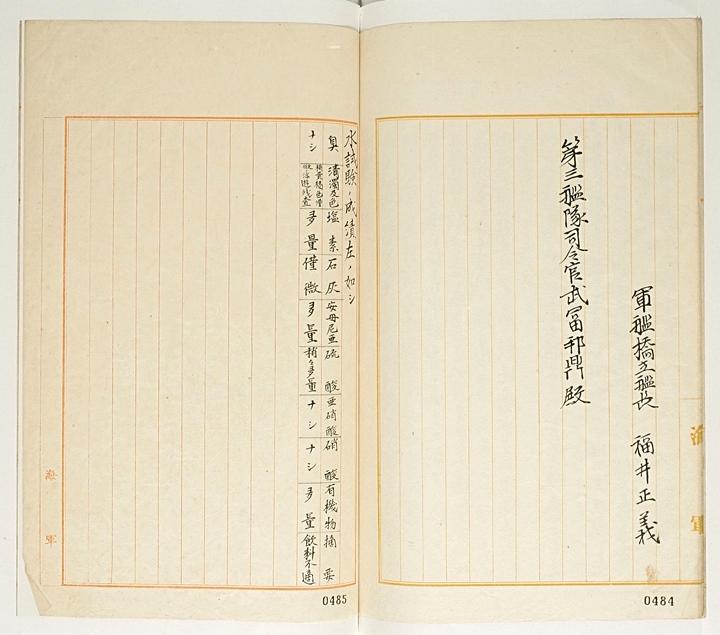 Also, these pages are intended to show that Korea’s outrage and disappointment over Japan’s repeated attempts to re-establish sovereignty over Dokdo are not based on blind nationalism. With Japan having no historical claim to Dokdo prior to 1905 what the Japanese are demanding is lands acquired during the height of her colonial-expansionist era be returned to her. Thus, it should come as no surprise that Koreans see Japan’s demands to return Takeshima, as a re-invasion of Chosun territory. From a another perspective, Japanese Military involvement on Dokdo during the incorporation process raises legal questions. Japan’s terms of surrender in WWII stipulate Japan must be expelled from all territories seized by greed of violence. Japan having seized Dokdo during the largest war of the day (Russo~Japanese War 1904~1905) leaves little doubt as to the intentions of her annexation. Secondly territorial acquisitions must be part of a natural and peaceful process as ICJ Judge Max Huber once ruled. Dokdo’s annexation was undertaken while Japan was appropriating Korean territory all across the peninsula. Most notably areas of strategic locations such as Chosun’s outlying islands (Geomundo, Chejudo, Ulleungdo, Uldo) and coastal cities. 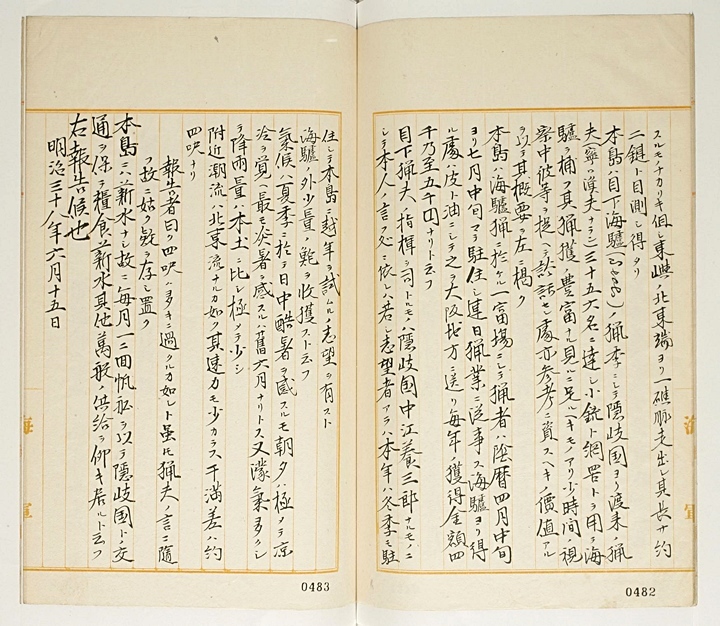 This website has at least eight pages of data from Japan’s own historical archives demonstrating the clear inseparability of Japan’s annexation of Dokdo from her military ambitions. However, Japanese websites lobbying for the return of Takeshima make no mention of these records at all. It’s clear the Japanese government has tried to sanitize her claim into a territorial – historical dispute when in fact the problem stems from Japan’s expansionist-colonial era a century ago. 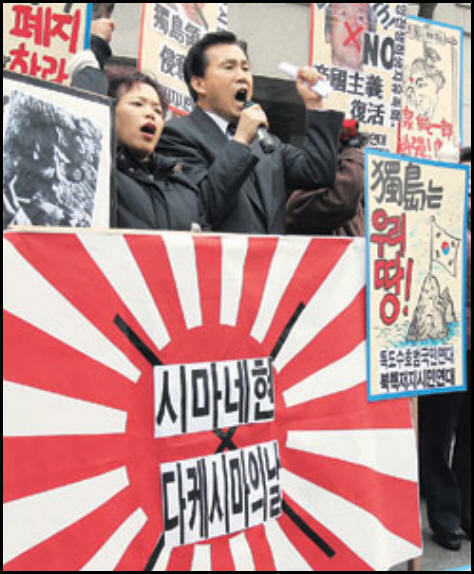 The Korean newpaper comic to the right criticizes Japan’s denial of her war past. The tormented ghosts of Japanese war dead grieve over Koizimi’s visit to the Yasukuni Shrine which honors some war criminals. 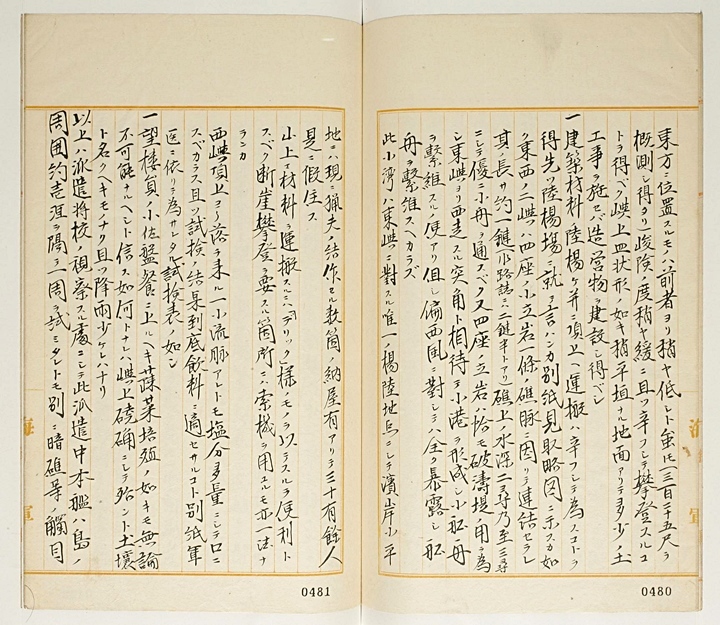 Japanese Professor Hideki Kajimura’s comments in his 1997 article “The Question of Dokdo – Takeshima brilliantly summarize the nature of the Dokdo problem. He is one of a growing number of Japanese who have the integrity to contfont Japan’s past expansionist aggression toward Korea.